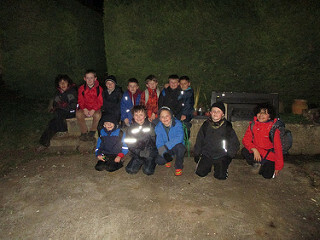 The 13 Cubs taking part in the hike together with seven Leaders and one Young Leader met at Baloo’s house in Sibford Gower at 19.00 on the Saturday night. Everyone was well prepared and suitably dressed for the hike and with their rucksacks and high-vizs on the Cubs looked seasoned walkers. Our route was a circular one approximately four miles long and took us along public footpaths across fields around the villages of Sibford Gower and Sibford Ferris with a very welcome break half way round where we were brought hot chocolate and biscuits. There were no mishaps along the way, the weather was once again kind to us and the Cubs were in high spirits as they walked. After the hike, we transported the Cubs back to Headquarters for a Pizza supper followed by Cookies then it was time for them to get ready for bed and slide into their sleeping bags for a good night’s sleep. It was the night that the clocks went forward an hour so when there was still quiet chattering at 23.00, we told the Cubs it was midnight, which was nearly true, and before long they were all fast asleep. They all slept well and had to be woken up in time for breakfast at 08.00 the next morning but there were still some very tired Cubs at 10.00 when they were collected by their parents. Another good activity enjoyed by both Cubs and Leaders alike.